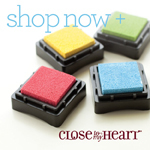 In celebration of National Stamping Month, Close to my Heart has created a limited edition card kit. This kit contains: Everyday Celebration Stamp set (only available in this kit), 16 Colonial White card bases and envelopes, assorted paper, 2 mini ink pads, ribbon, foam squares, sponge, mini-medley accessories and instructional brochure. There will be 3 ways to earn this great kit for free; one of which begins today! From now until September 30th, purchase a minimum of $60 in stamp sets (excluding stamp of the month, Art & Soul discounted products and custom stamps) and you will receive one of these great sets for free! The other parts of the promotion begin September 1st. So, be sure to come back for the details on that, at the end of August.